Vall Nord is the collective name for 3 ski resorts in Andorra - Pal, Arinsal and Arcalis. For a number of years we have ignored Vall Nord - what an error this has been! We ignored the area because we didn't understand how it all fitted together - where the hotels were, how you go to the lifts and so on. Basically Pal and Arinsal is one ski area. La Manssana at 1230m is the resort that services the Pal sector. 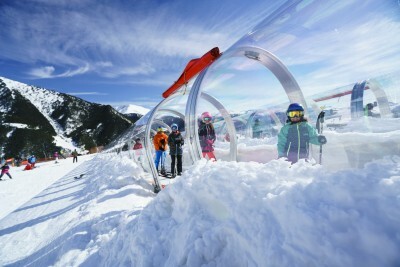 A bubble lift rises from the centre of the resort up to La Caubella at 1950m. Further up the valley is Arinsal at 1475m. 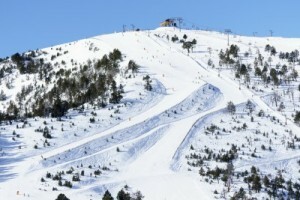 From Arinsal there is a choice of bubble lift or chairlift to access the ski area. At the end of the valley is Arcalis. Arcalis is a ski area without an actual resort. A regular free ski bus runs from Andorra La Vielle through La Manssana and Arinsal up to Arcalis every 30 minutes. Arcalis is definitely worth the effort of a bus ride. The ski area has won all sorts of awards over the last few years and it is easy to see why. Pal is a unique ski area - high so very snow sure but also tree lined. Green, blue and red runs criss cross the mountain side from the main bubble lift station at La Caubella over Pla de la Cot at 2052m on to the highest point in the sector at Pic del Cubil - 2358m. From Pic de; Cubil wide blues and reds drop down to Coll de la Botella - years ago a old smugglers route to Spain! From the col a new cable car rises up to Pic Negre and links in to Arinsal at just over 2500m. The Arinsal sector is a wide bowl sweeping down to Comallemple at 1950m From Arinsal a bubble lift rises up from the centre of the resort to Comallemple, or if you are staying in then there is a fast 6 man chairlift right by the hotel which again ends up at Comallemple. The British influenced ski school meets here every morning. The whole Arinal bowl offers lovely long blue and red runs access by a series of fast 6 man and 4 man chair lifts as well as a hand full of drag tows. Situated at the head of the valley Arcalis is unique fabulous and fast becoming one of our favourite ski areas! From the base station at 1940m chairlifts rise up on the left hand side to 2332m accessing some steeper pistes along with the FIS race course - though come right off the chair to some wide open blue runs than meander back down to the base station. The fast 6 man chairlift up to Les Portelles at 2552m opens up Arcalis' secret - ski down to Coma del Forat and jump on the Creussans 4 man chair - up to 2625m at Cota - this lift serves one freeride mountain - no pistes just suggestions of where to go - off piste freeride skiing at its best - lift served and patrolled! 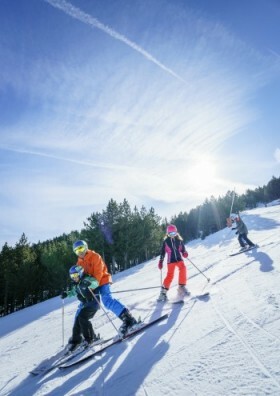 Beginners (both adults and children) staying in Arinsal will be taught by some of the UKs best ski instructors in the Vall Nord Ski School. If you stay in La Manssana, the ski school starts at La Caubella every morning and like Arinsal there are many British instructors. Under careful guidance beginners will soon gain the confidence to use the chairlifts and start exploring the area on the wide blue runs. After 2 or 3 days there is no reason why a confident beginner can't make it over to Pal and La Taberna at La Caubella for lunch. At the end of the week beginners show make the effort to get up to Arcalis where they will be rewarded by wide long open blues - El Tunel from the top back to the base station is a long wide gentle run taking in some gorgeous high mountain scenery. Intermediate skiers will thrive in Val Nord - start the week cruising then blues are red runs in Pal and Arinsal - try the FIS Slalom run down to Coll de la Botella; perhaps brave the black runs at Arinsal? Let the skis run down La Solana in Arinsal then carve up the wide tree lined reds over in Pal. It is definitely worth taking the bus up to Arcalis - you'll love the wide open pistes accessed by fast chairlifts. La Portella del Mig is a long sweeping red from Les Portelles back down to the base station - head right as you come down to the base station to try the steep FIS race pistes, or back up to Les Portelles and the fabulous La Balma and Ls Canaleta reds which swoop back down to the valley. Take the Cota chair for your first taste of Freeride skiing!! First things first - don't be put off by the piste map - we were and it is something that we regret! While Pal and Arinsal are generally better know as beginner / intermediate resorts you will be surprised - let you skis carve up the long perfectly groomed reds - Corpalance, Fontanals and Cubil in the trees over in Pal are fabulous while heading over to Coll de la Botella opens up longer reds and the FIS race piste. Have a crack at L Comellade - a steepish black through the trees down to Els Fontanals. Over in Arinsal head up La Capa - a short sharp drag tow to the summit - La Capa is a black run down the face, but also you'll often find some untracked off piste up here. The Tub de Coll drag serves a couple of steep reds and a black - otherwise swoop down the reds and blues at pace down to the main lift station at Comallemple. You'll need to spend a few days up at Arcalis - Arcalis is fast becoming a freeride mecca of European skiing and the ski area has won all sorts of awards as well as hosting a round of the Swatch Freeride tour - other rounds are held in Chamonix, Alaska and Verbier - which just shows what high regard the freeride community have or Arcalis. The pistes are all long wide and well groomed - great for warming up. Then start on L'Hortell - to the left of the draglift there are some wonderful steep gullies - be careful not to go too far to the left or you'll end up on the main road waiting for the free ski bus to get back to the lifts. Jump on the fast 6 man chair up to Les Portelles - take La Balma a flying red to the exclusive Freeride Drag tow - all the terrain from the top of the drag is off piste with variously routes either back to the base station or down to the La Canaleta red piste. But the real attraction here is La Cota - a quad chairlift up to 2625m which opens up one big freeride mountain - go anyway but be careful - the mountain is patrolled but it is off-piste! 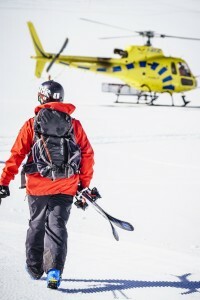 Oh and did we mention Heli Skiing? Yes Heli Skiing is available in Andorra with drops available all over the principality from Arcalis. Val Nord is perfect for skiing with the family - British run ski schools, wide open slopes, some technical slopes to keep the faster skiers happy and of course Arcalis - while a bus ride away the skiing for all levels is fabulous - kids revel in the long wide pistes, trying to beat Mum and Dad back down to the bottom! Over at Arinsal all runs come back to the Comallemple so there is no chance of anyone getting lost even if they take a different run down. 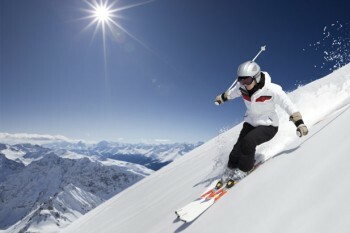 Pal offers the protection of skiing in the trees - wide gentle runs, fast chairlifts. Vall Nord has three ski schools - one in each sector and employs over 250 instructors. Many are British and the influence of BASI (British Association of Snowsport Instructors) is very apparent throughout the ski schools. Class sizes are no more than 10 and all levels are catered for. Private lessons, guiding and off piste freeride are also available. 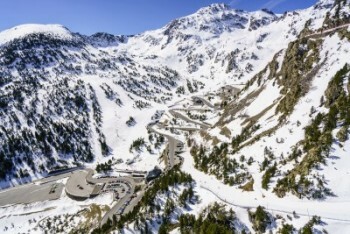 Vall Nord operates a free ski bus that connects Andorra La Vielle (the capital of Andorra) with La Massana (to ski in Pal) and Arinsal. 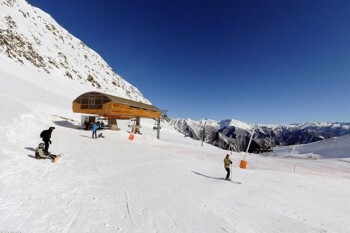 The ski bus runs every 15 minutes between Andorra La Vielle, La Massana and Arinsal. There is also an evening bus down to and from Andorra La Vielle - for shopping and to visit Caldea - the fabulous spa swimming pool. The Ski bus to Arcalis runs every 30 minutes from 8.15 through to 10.15 then the return is from 15.15 through to 17.15. La Massana is a vibrant resort town situated in the valley below the Pal ski area. The ski area is connected by a fast gondola ski lift from the centre of the resort. The resort has grown quickly over the last few years and now has a wide range of shops, bars and restaurants. The capital town of Andorra La Vielle with its vast range of duty free shops and wonderful spa Caldea is just 10 to 15 minutes away. Arinsal is one of the original Andorran resorts - spread along the main road up to Arcalis, Arinsal is renowned for good après ski - the Surf at the bottom of the gondola , British owned El Moli through to an authentic Irish Bar - El Derby . Over the years the resort has become a lot tamer and family friendly. There are a whole host of shops, bars and restaurants to keep everyone happy. 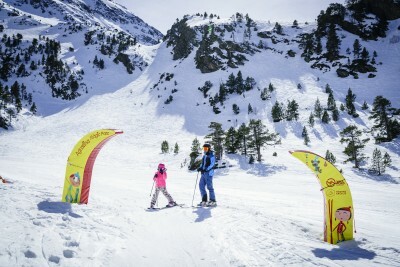 Andorra La Vielle connect by regular bus services is around 30 minutes away and well worth a visit.